Dr. Norris received a B.S. in Zoology in 1981 from the University of Oklahoma and his Doctorate in 1986 from Oklahoma State University. 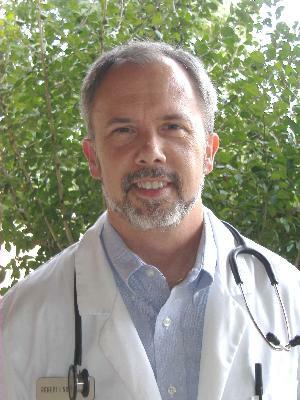 Over the years he has developed a special interest in soft tissue surgery, internal medicine and endocrine diseases. He grew up in Northern California where he raised and showed Irish Setters. Along with his practice, Doc has stayed busy raising a family and being involved in Church, Rotary, and Community Activities. When possible he enjoys fishing and traveling and best of all enjoys spending time with family. Growing up around livestock and being involved in FFA prepared Kellie for a career in the veterinary field. Kellie has had over 26 years experience as a technician and receptionist. Kellie joined us at Bridge Street in 2005. She has two Dachshunds named " Kinsley" and "Nessie" . When Kellie is not at the clinic she loves spending time with her husband, kids and granddaughters, at the lake or shopping. Suzanne has worked around animals for a few years now and joined out team in 2011 as a receptionist. She has a caring, bubbly, outgoing personality which makes her a perfect match for the clinic and patients. At home she lives with "Flooze" the black cat, a lab mix named "Boudreaux", and HUGH lab mix "Bear". She loves to spend her spare time with her family. Suzanne also love to cook and can often be found in the kitchen trying out new recipes. Some of you might recognize this familiar face since Michelle has worked for Dr. Norris on and off since she was in Hish School. Now she is married and has 3 awesome and active boys but still found the time to come back to work here at the clinic. She works a technician now and a receptionist for a few years she truly is an asset to our family and we love having her back. Michelle likes to go antiquing and spending time watching her boys play all there sports, hunting on there dear lease and BBQing. Bio's on Stefani, Melanie, Amanda,Amie and Ashley to come.